Medium Format DSLR are high end professional DSLRs with sensor size up to 36 mmx48 mm, very high pixel density like 40 million pixels as opposed to full-frame DSLR. We ‘normally’ use full-frame DSLRs as professional and high end DSLRs which has the sensor size equivalent to 35 mm film SLR camera. During the last phase of film cameras, 35 mm became the mainstream, while Medium Format SLR and other kind of cameras had bigger film size. It must be noticed that, most consumer grade DSLRs are equipped with APS-C sized sensor – not a Full-Frame sized Sensor. Medium Format DSLR cameras deliver more pixels than consumer-grade cameras and even professional Full-Frame DSLRs, they have quite lower noise as expected. Medium Format sensor is hugely used in space photography, but by definition they are not Medium Format DSLR cameras. Since the year 2000, there was a craze for manufacturing Large Format and Medium Format DSLR cameras. Contax, once king in Film manufacturing industry Kodak and Bronica were remarkable brands. But gradually this craze ceased and Full-Frame DSLR became the professional standard for compatibility of Lens, size, cost etc. 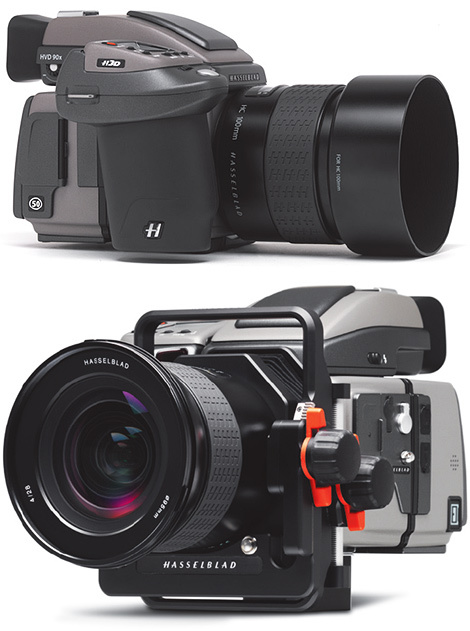 However, Hasselblad continued production of Medium Format DSLRs and really modernized it. This company is known to be one of the best camera manufacturer since World War II. When man landed to moon for the first time, two things remained constant since then – Hasselblad’s Medium Format and UNIX Operating System (read OS X). As UNIX website says “Celebrating 40 years of uptime”. Apart from Hasselblad, SLR and rangefinder camera giant Leica, Mamiya are predominant brands who manufacturers state of art Medium Format DSLRs. As the size of the sensor increases, other parameters also needs to be of higher tech or optical specs. The image rendering engine / rendering processor is often of very high quality, the processor can sport a multi core processor, the storage medium can be a SSD. Some manufacturers and models uses other computing device manufacturer’s OEM unit for the needed computing power. There are also Medium Format DSLR cameras that can give up to 144 megapixels output and generate files of unimaginable dimensions, because one image file can be about 397 Mbytes or if you are working in 16-bit the size goes up to 794 Mbytes! Megapixel count can be 60 megapixels or more. The lens mounting system is also different. It is obvious that the price of a Medium Format DSLR starts from late four digits in USD and has no limit on the higher end as they might be custom ordered. This Article Has Been Shared 4238 Times! Compact Digital Camera are becoming very popular due to their less cost bracket and very handy and easy to carry pocket-able size. Lets us see the technical aspects of any Compact Digital Camera. Portrait Photography has been opened up more experimental opportunities with the penetration of Digital Camera due to a big factor – the cost reduction of Film. Cite this article as: Abhishek Ghosh, "Medium Format DSLR Details," in The Customize Windows, May 2, 2013, April 23, 2019, https://thecustomizewindows.com/2013/05/medium-format-dslr-details/.